Introduction to super markets The "normal" way to buy food has changed dramatically over the last half century, with the small independent shops such as butchers, greengrocers, fishmongers and bakers which dominated the High Street in the 1950s disappearing and being replaced by the ubiquitous supermarket. Today, 60% of British shoppers purchase most of their groceries in one weekly shop. The growth of the sector over the last fifty years has been remarkable. In 1950 the multiple supermarkets represented just 20% of the food retail market. By 1961 this had risen to 27%; by 1971 to 44%. As the trend continued, a generation has grown up relying on the convenience and choice of supermarket food. Of course some independent retailers went out of business, but the consumer is king - and consumers felt that the price was worth paying. But the price tag got higher. Between 1997 and 2002 more than 13,000 specialist stores around the UK - including newsagents, Post Offices, grocers, bakers, butchers - closed, unable to cope with the competition from the multiples. A recent study by the Institute of Grocery Distribution revealed that 2,157 independent shops went out of business or became part of a larger company in 2004, compared with a previous annual average of around 300 a year. Traffic congestion rocketed as more large stores were constructed out of town. Tales abounded of the negative impacts of low supermarket prices on farmers and food processors, whether the UK or abroad. By 2005 a mere 8% of food was purchased from the independent sector. Tesco and other supermarkets claim that their growth is occurring purely in response to the desire of consumers. 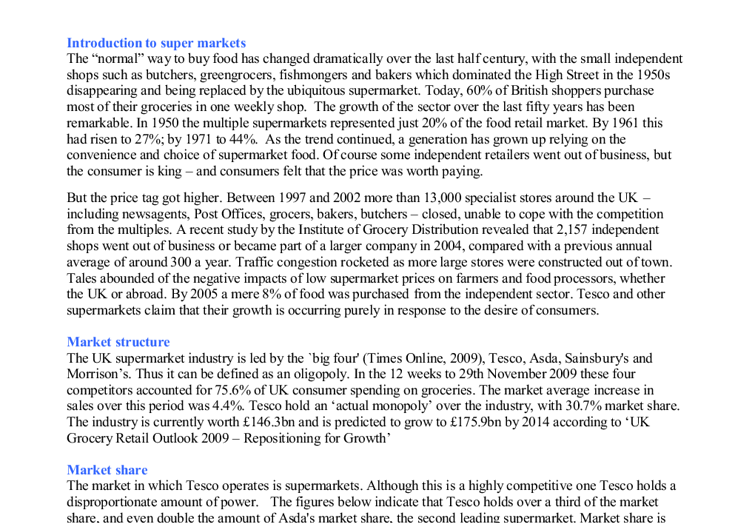 Market structure The UK supermarket industry is led by the `big four' (Times Online, 2009), Tesco, Asda, Sainsbury's and Morrison's. Thus it can be defined as an oligopoly. In the 12 weeks to 29th November 2009 these four competitors accounted for 75.6% of UK consumer spending on groceries. ...read more. and branching out into the North of England and Scotland Morrison's have 420 UK stores and three distinct brand values: Fresh, Value and Service. These values provide the flexibility to react to market changes and consumer trends. Morrisons aim to offer more freshly prepared food than any other retailer and have more staff preparing food than any other supermarket. The retailer grew in strength and expanded into the South of England following the acquisition of Safeway in 2004. Unlike its closest rivals Morrisons decided not to enter the convenience store sector. Vertical integration is key to the retailer's success; Morrisons own their factories, production facilities and distribution network. With these facilities Morrisons can get food to stores faster so that it's fresher. Morrison's have invested heavily in training and their staff is highly skilled and know their trade. Level of contestability A contestable market occurs when there is freedom of entry and exit into the market. Thus there will be low levels of sunk costs. Thus, when considering the contestability of supermarkets it is important to consider the following points: Barriers to Entry Barriers to entry in the supermarket industry are obviously extremely high, due to the massive market share held by the four main UK supermarkets. Small food retailers can be assisted in their growth by the government, with incentives such as tax relief and grants. Economies of scale are the second important barrier to entry. 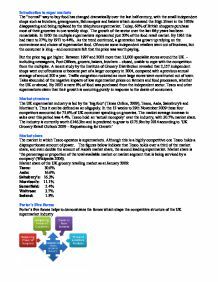 In addition to the usual one, the UK grocery retail market has a special economy of scale arising from the substantial bargaining power which retailers enjoy over their suppliers, the manufactures of food and grocery product. Updating earlier analysis, it has been observed that the European new contracts, Aldi and Netto have some ability to defeat this barrier. Aldi enjoys a buying-power derived economy of scale advantage in the European countries in which it has a large market share. ...read more. Conclusion Large supermarkets and Convenience stores dominate the UK retail market. Supermarkets account for three-fourth of the sales while convenience stores and traditional retailers taking rest of the pie. Convenience markets have been on rise in terms of numbers and the revenue generated, in past few years. As a result of which the traditional retailers are loosing out thus leaving the UK market open for Supermarkets and Convenience stores. This RNCOS research has found that the competition among the supermarket chains in UK is primarily based upon the prices, which in turn has resulted in the low profit margins for the industry thus affecting its growth. This research study has also found that the dwindling profits of the supermarkets have forced them to look for the other avenues to remain competitive in the market and 'Product' & 'Process' innovation are the areas where the UK retailers have focused their attention. Furthermore, UK retailers have to watch out for emerging competition from the retail markets of Asia and Eastern Europe. The UK supermarket industry is led by the `big four' (Times Online, 2009), Tesco, Asda, Sainsbury's and Morrison's. Thus it can be defined as an oligopoly. In the 12 weeks to 29th November 2009 these four competitors accounted for 75.6% of UK consumer spending on groceries. The industry is currently worth �146.3bn The growth of the sector over the last fifty years has been remarkable. In 1950 the multiple supermarkets represented just 20% of the food retail market. By 1991 this was 60%. As the trend continued, a generation has grown up relying on the convenience and choice of supermarket food This RNCOS research has found that the competition among the supermarket chains in UK is primarily based upon the prices, which in turn has resulted in the low profit margins for the industry thus affecting its growthLarge supermarkets and Convenience stores dominate the UK retail market. Supermarkets account for three-fourth of the sales. However, UK retailers have to watch out for emerging competition from the retail markets of Asia and Eastern Europe. ...read more. This is an excellent and full analysis of the industry. The writer introduces and applies a number of economic concepts to deliver a sound analysis of an oligopolistic industry. Thus, profits serve as an indicator for firms and suppliers to allocate their scarce resources. In addition, when a market is offering supernormal profits, there is an incentive for new suppliers to enter the market in the long run - providing that barriers to entry are not prohibitive. However, governments around the world would not consider the Basic Economic Problem their top priority, for example currently; many governments are trying to cope with the recession and trying to restart their respective economies. Others are fighting wars - such as Britain in Afghanistan and public pressure around issues will push the Basic Economic Problem down on government agendas. The usefulness of PED will always be limited by the accuracy of the statistic, thus, if the data is unrepresentative, poorly sampled or outdated, it can lead to misleading information and as such poor decisions being taken based on them. In the case of minimum prices, it could lead to producers who are willing to sell at a lower price, doing so informally in order to increase revenue over their competitors. This could then lead to the demand for other suppliers falling considerably, in turn, hurting the rest of the industry. policy can only be implemented to increase revenues until the price elasticity of demand reaches 1, at which point the firm will have to adopt other strategies to increase revenue. Another likely strategy adopted by a firm could be a switch in the nature of the good produced. There are several advantages and disadvantages of mixed economy. The advantages of mixed economy Mixed economy provides free competition. For example, the presence of private enterprise ensures that there is fair competition in the market, and the quality of products and services are not compromised. Next, by using mixed economy, market prices will be well regulated. Consequently, if speed cameras cause accidents, and the government knows about it, this emphasises that perhaps governments only install them to generate revenue source and one may question the mortality of this if lives are lost to only to raise revenue for the government.